Things are not at all what they seem in this picture book mystery filled with rhyming wordplay. “It’s a perfect day to catch a cat,” muses a dog. But to his annoyance, all he seems to find are things that rhyme with cat. Rat. Bat. Gnat. Why can’t he catch a cat?! 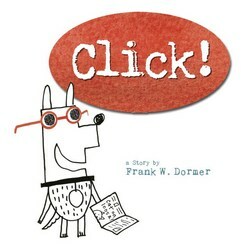 In a fascinating and delightful twist, we “click!” see the reason: the cat has been telling the story all along! A picture book mystery for very young readers. Click! Click!